I happened to come across Melissa P's gorgeous little pin cushion recently, using her Trellis Flowers block pattern and instantly fell in love. Sure enough it immediately went to the top of my sewing to do list, and I'd whipped up one in no time at all. Melissa is the queen of fussy-cutting so I took a leaf out of her book when creating my version ;-) a fussy cut flower for the centre and gingham scallops for the border. I had a bit of a mind blank trying to work out how Melissa turned hers into a pin cushion, but eventually I had worked out something similar!? So if you fancy making one as well, here's a quick little 'how to'. First off, go and print off the free Trellis Flowers pattern available here. 1. 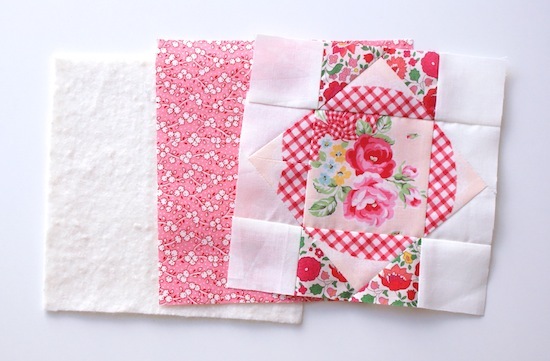 Once you have completed the quilt block, cut the backing fabric, and layer of wadding (optional) of the same size. 2. With right sides facing, sew 1/4" all the way around, leaving a gap big enough for turning inside out. 3. Re-position your corners as shown above (with the seams in the centre). Draw a line 1.5" down from the tip. Sew along the line. 4. Repeat to all four corners, so you have something that looks like above. 5. Turn inside out and stuff, stuff, stuff! When you think you've got enough - push more in! You want it so it's nice and plump! Sew the hole closed with a whipstitch. 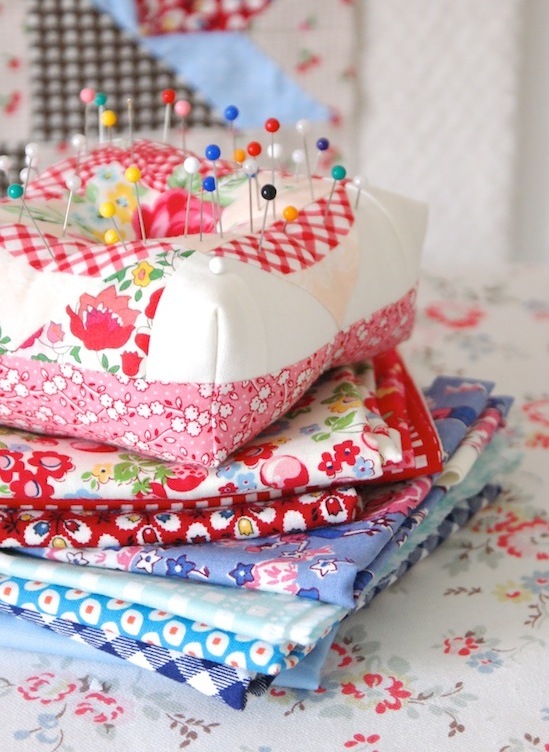 Push the centre of the pin cushion down and thread a button through the middle. This one above is actually another one I made, but I gifted this one to a very nice lady I met from British Patchwork and Quilting magazine (more on that another time!). 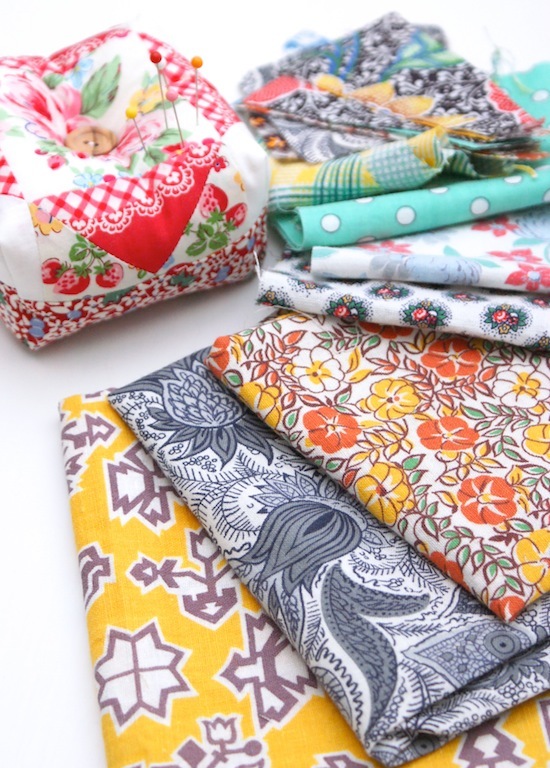 It was in return of her sending me those absolutely gorgeous feedback fabrics!!! I've got another couple of pieces of feedsack fabrics in my stash that I've collected from Etsy - so nice I have yet to use them! :-/ Though I've been thinking I will use these in some Lucy Boston 'Patchwork Of The Crosses' EPP blocks. Have you seen that quilt? I know a couple of my Sew and Quilt customers are doing it. I'm chomping at the bit to start but trying to crack on with appliquéing some more of my diamonds from the other EPP project I have on the go. Que linda essa almofada ! Sempre quis fazer uma desta mas tenho medo de não conseguir fazer e acabar estragando material. Mas um dia tomo coragem bjs. So lovely! Thanks for the link. I'll give it a try. super cute... think i will try one soon! Oh my gosh that is so stinking cute!!! Sooooo pretty. Those fabrics are adorable. ooo you are clever ! and it all always looks so pristine and neat, sighs,perfect. That is the cutest pin cushion. I'm loving those fabrics in your last photos!